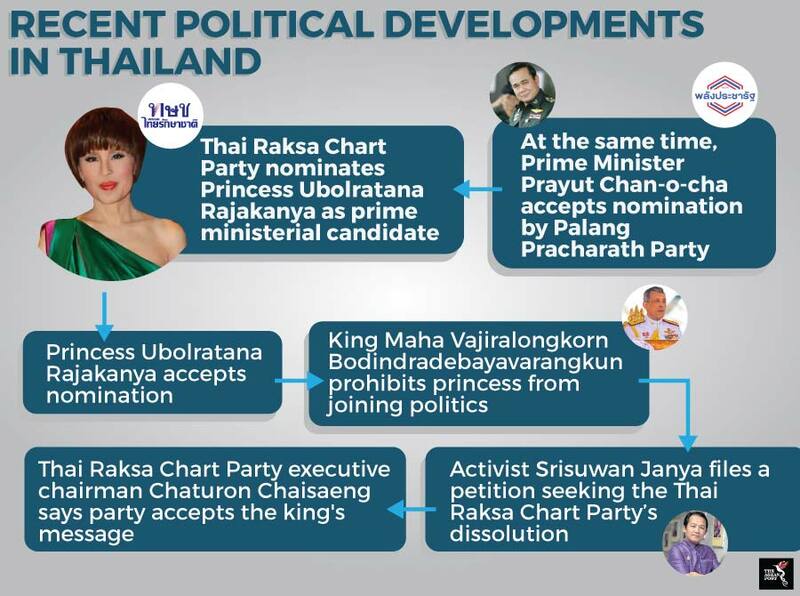 Thailand was recently taken by surprise when news broke that its princess, Ubolratana Rajakanya, had been announced as prime ministerial candidate for the Thai Raksa Chart Party – a party reportedly affiliated to Thaksin Shinawatra. Meanwhile, Prime Minister Prayut Chan-o-cha, who led the 2014 military coup had also accepted the nomination by the army-aligned Palang Pracharath Party to be its candidate for prime minister. There is little doubt that there exists some friction between the current junta and the Shinawatras. It was, after all, the Shinawatras who were ousted during the 2014 military coup. More than that, Under the military government's new constitution, which the military has said was aimed at weakening major political parties, constituency seats in provinces where the Shinawatras have previously held dominance have been effectively cut. Nominating Princess Ubolratana for their prime ministerial candidate and later receiving confirmation that the princess had accepted the nomination must have put a smile on the Thai Raska Chart Party leaders’ faces. After all, the monarchs are considered semi-divine in Thai society and while Uboltrana may have lost her royal status in the 1970s, she was still considered a Thai princess. It wouldn’t be too far a stretch of the imagination to believe that the party leaders had finally felt as though they had gotten the upper hand after numerous attempts by the junta to stifle the Shinawatras’ and their associated parties’ political influences. The possible euphoria, however, was short lived after Princess Ubolratana’s brother, King Maha Vajiralongkorn Bodindradebayavarangkun himself, published a statement in the Royal Gazette and broadcast nationwide on all television channels that while the princess had relinquished her royal title in 1972, she remained a royal family member by tradition. “Bringing a high-ranking member of the royal family to politics, in whatever manner, is an act in violation of the royal tradition and national culture and highly inappropriate,” he said. “All constitutions, including the current one, have a chapter on His Majesty the King. It contains provisions endorsing the special status of the royal institution in line with the constitutional monarchy rule. “The king is above politics and holds a position of respect. No one may violate, accuse or file charges against him in any way. The provisions also cover the queen, heir-apparent and royal family members close to the king”, the king’s statement read. Perhaps the biggest blow that followed the announcement of the princess as its prime ministerial candidate was not having that idea shut down by the king, but coming face to face with a possible all-out ban from participating in Thailand’s first election since the 2014 military coup. Srisuwan Janya, secretary-general of the Association for the Protection of the Constitution, recently told the media that he would file a petition seeking the Thai Raksa Chart Party’s dissolution. "The royal announcement made it clear that the party violated electoral law," Srisuwan told Reuters, adding that his complaint to the Election Commission would ask it to recommend that a Constitutional Court dissolve the party. Meanwhile, the party’s executive chairman Chaturon Chaisaeng has declined to comment on the request to disband it. Instead only telling media that it would accept the king's message and "move forward into the election arena to solve problems for the country". If you’ve ever played cards, whether it’s Poker or even Go Fish, you’ll know that one of the most important rules for most card games is to not show your opponent what cards you have in your hand. Following the announcement of the princess as its prime ministerial candidate and the quick dismissal of such a decision, it’s unclear whether the Shinawatras and the Thai Raksa Chart Party have shown their hand or still have an ace up their sleeve. To be fair, the same can be said about Prayut, the military junta, and now the Palang Pracharath Party. If current events are anything to go by, it’s likely that the surprises won’t end until polling day finally comes for the Land of Smiles. Are the Shinawatras planning a comeback?